Cape Shiosai (夕陽と潮騒の岬) is one of the best view point of Mt. Fuji. 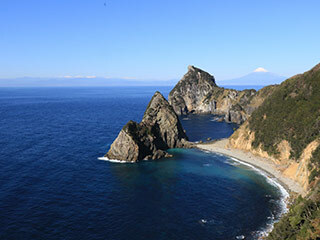 It is located west side of Izu Peninsula. It is located in the Yuuhi Shiosai Misaki Auto Camp Site. You can see great view of Mt. Fuji with Suruga Bay and Mt. Eboshi. At the far away, you can see also 2nd and 4th tallest mountains in Japan. Mt. Eboshi is the sister of Mt. Fuji in Japanese Myth. Admission: 200 yen per person for 1 hour. There is an auto camp site that you can park and pay the admission. You need a car to visit here. Drive route 136 south to Matsuzaki. There is side way to visit this camp site.